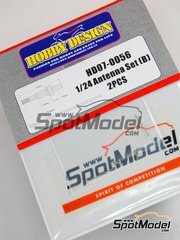 Do you remember the Esci kit or the re-edition made by Revell? 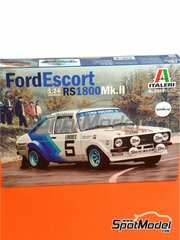 Italeri brings us this dream again in the form of a scale model, being a new re-edition of the Esci kit but this time with new decals. 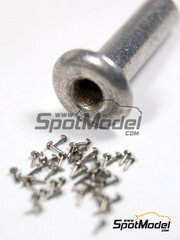 Bag with 40 round head rivets measuring 0,50 mm diameter, exquisitely turned in metal. 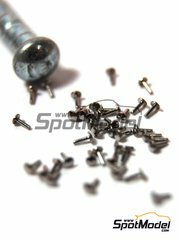 Bag with 40 round head rivets measuring 1,00 mm diameter, exquisitely turned in metal. Bag with 40 rivets measuring 0,50 mm diameter, exquisitely turned in metal. 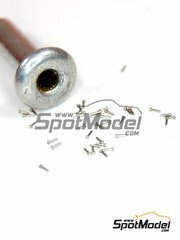 Bag with 40 conical head rivets measuring 0,50 mm diameter, exquisitely manufactured in turned metal. 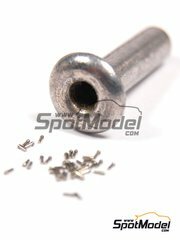 Bag with 40 conical head rivets measuring 1,00 mm diameter, exquisitely manufactured in turned metal. 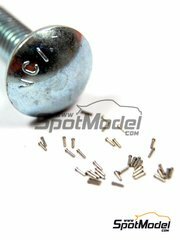 Gorgeous turned metal push buttons, perfect for detailing in both 1/20 and 1/24 scales. 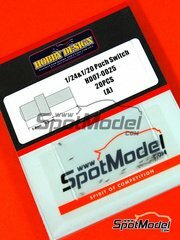 Set of 20 push button switches, perfect for detailing your 1/20 and 1/24 scale models. 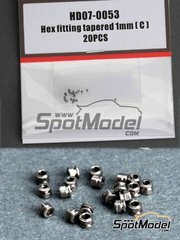 1.0mm chamfered hex nut to make your own fittings and pipe joints. 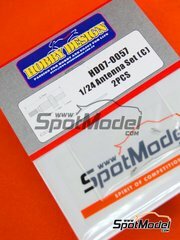 Set of two antennas formed by a turned metal base and a metal rod. Fantastic!! 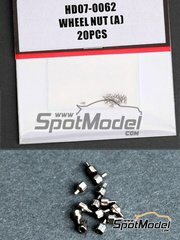 Fantastic nuts for improving the looks of your 1/24 scale rims, and even 1/20. 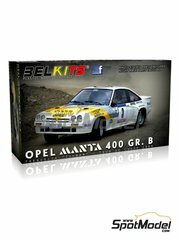 A new creation by Belkits !!!! 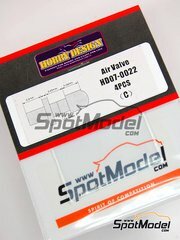 Inside the HUGE box you will find photo-etched parts, night lights, round and square headlights, different rim models, fabric for simulating seatbelts, decals printed by Cartograf, and more and more and more. 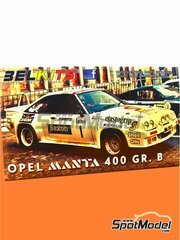 Absolutely essential in your collection!! 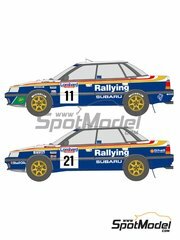 Includes both photo-etched and plastic parts for recreating the night stages version, in addition to several different rims, seatbelt fabric, Cartograf printed decals, and more and more and more. 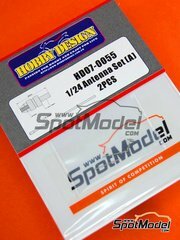 Absolutely essential for your collection!! 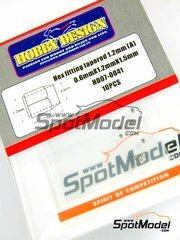 Specifically conceived and designed bench for assisting you during the assembly of your 1/12 scale motorcycles. 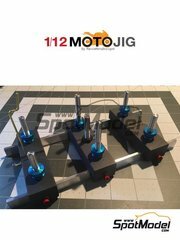 It will help you keeping symmetries and parallels, facilitating the manipulation during the whole assembly. A fantastic tool without any doubts. 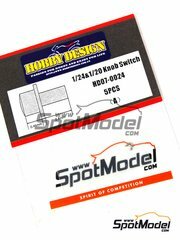 Decals for decorating the official team Subaru Legacy as it raced at the New Zealand Rally in 1993. It includes two different number pads so you can choose your favorite driver. 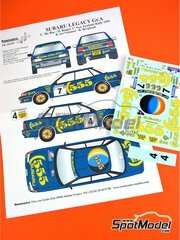 Extensive decals sheet with the whole livery of the official team Subaru Legacy RS that raced the 1991 RAC Rally, including three different number pads. 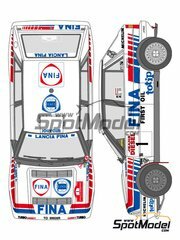 Decoration for the official team Lancia Delta during its participation at the rally of France in 1990. 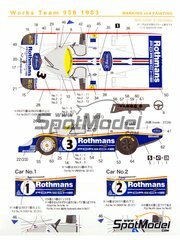 Freshly Japan printed decals for either replacing the originals on your old kit or for using with your new builds of the Lancia Delta HF 16 valves. 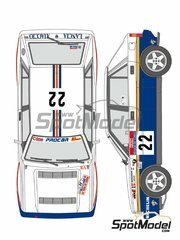 Time limited re-edition of the decoration used by the official Porsche team as it raced at Le Mans in 1983. 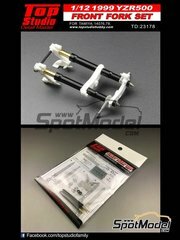 Update the front fork of your Yamaha YZR500 OWK6 model with this Top Studio reference. You'll hallucinate with the fantastic finish of all the turned metal, photo-etched and the resin parts.